MELBOURNE, Austrialia — If Jaws left you fearful of going into the water, this story about a much, much smaller predator may only reinforce your fright. 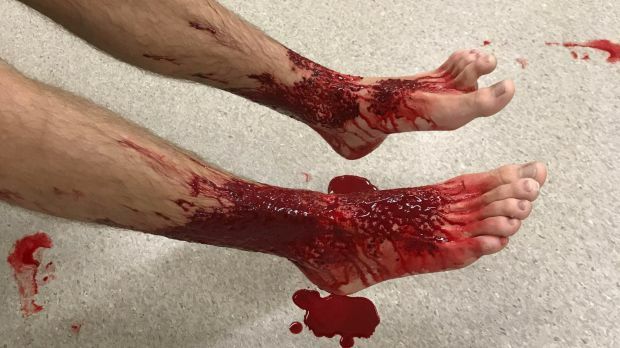 The Australian Associated Press reports on the case of Sam Kanizay, a Melbourne 16-year-old who spent about a half-hour soaking his legs, sore from sports, at Dendy Street Beach in Brighton on Saturday. He emerged with his legs dripping in blood. “As soon as we wiped [his legs] down, they kept bleeding,” Sam’s father, Jarrod Kanizay, tells the AAP. (Very graphic photo here.) “They ate through Sam’s skin and made it bleed profusely.” And they left doctors stumped. But there have been theories aplenty, per the New York Times and the AP: Some were sure that sea lice, a group of crustaceans known as isopods, were responsible. The head of the Dolphin Research Institute points the finger at another group of crustaceans called amphipods; another marine expert speculates it was jellyfish larvae. As for Thomas Cribb, a parasite expert at the University of Queensland, “it’s not a parasite I’ve ever come across.” In a quest to find the answer, Jarrod Kanizay headed for the beach Sunday night with a wetsuit, a pool net, and pieces of steak to use as bait, and captured “thousands of little mite-type creatures.” He has shared an unappetizing video of them noshing on the meat. A marine biologist with Museums Victoria analyzed a sample taken by Kanizay and says they’re lysianassid amphipods, or sea fleas. He speculates they have a leech-like anti-coagulant that kept the blood flowing from Sam’s legs, and said the teen may not have felt the bites because of the chill of the winter water.